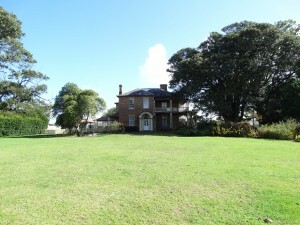 The Massey Homestead is an imposing historic building set in extensive gardens on Massey Road, Mangere East. It was for some years the home of William Ferguson Massey, who was Prime Minister of New Zealand from 1912 to 1925. 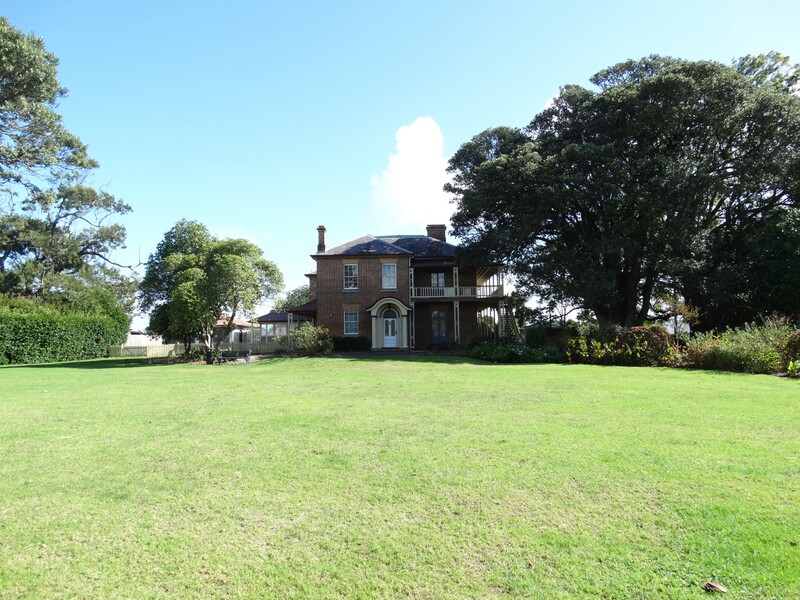 This is a brief history of the homestead, its ownership by the Massey family, its purchase by Manukau City Council, and its development as community and cultural centre. In 1849 or 1850 the landowner and former missionary William Fairburn sold 220 acres of rural land on Mangere Road to the timber dealer Daniel Lynch. 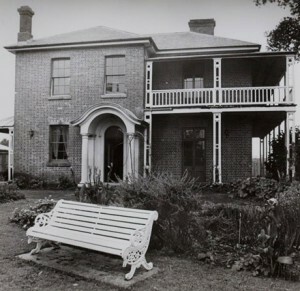 About 1853 Lynch built an ornate two-storeyed red brick and timber homestead on his estate in what is now Mangere East. The homestead was designed in the English colonial style with Regency details. 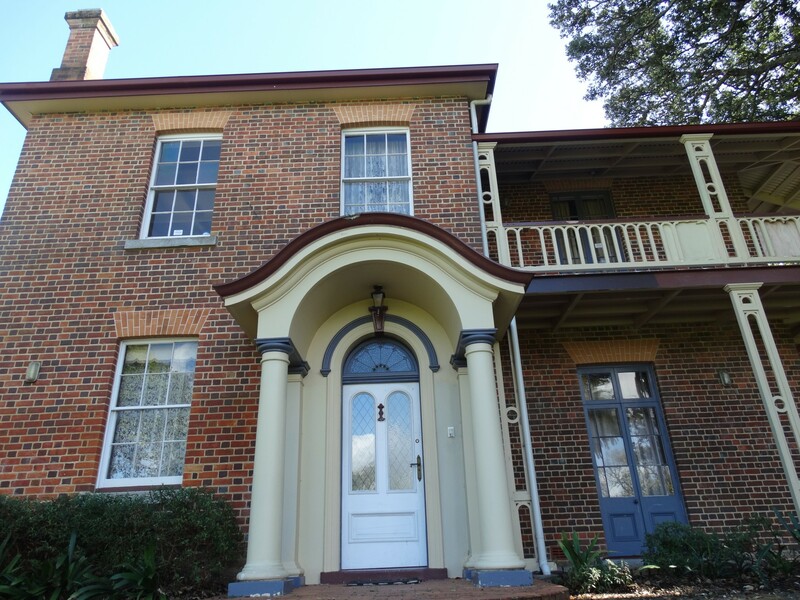 Native timber was used extensively but its red bricks and slates were brought from Melbourne. 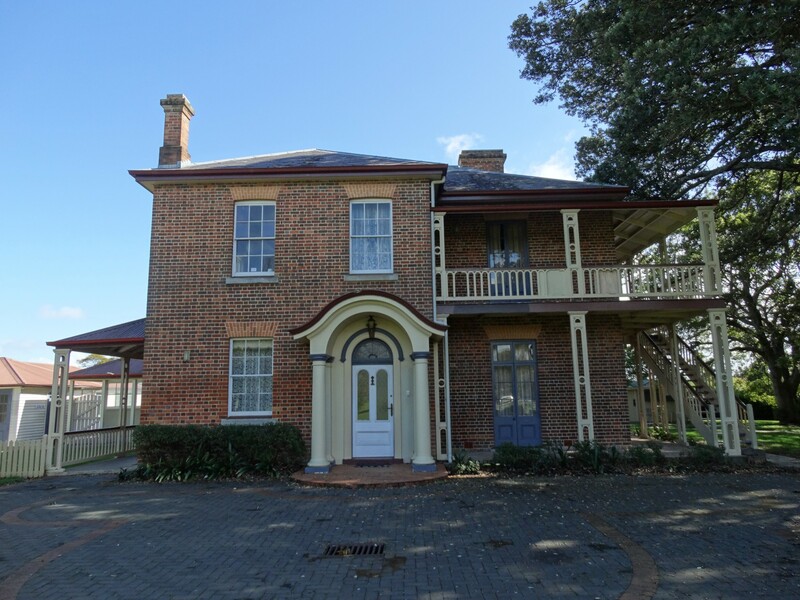 Lynch’s two-storeyed homestead was one of the most notable and substantial brick houses in South Auckland and in May 1869 he offered it for use as a hunting lodge when Prince Alfred, the Duke of Edinburgh, and his shooting party passed through Mangere during his New Zealand visit. Lynch retained his Mangere estate until 1890 when it is said that financial difficulties forced him to sell his land. Two hundred and nine acres were bought by two speculators, William Francis Buckland, an Auckland solicitor, and John Roberts, a gentleman from Dunedin. On 29 September 1890 Buckland and Roberts sold 16 acres, 2 roods and 38 perches (about 6.8 hectares) of their land, including the homestead, to Mangere farmer William Ferguson Massey. Massey was looking for a new, less flammable house because his former wooden farmhouse in central Mangere had just burnt down. The homestead and surrounding land cost Massey £600. He immediately arranged a £500 mortgage from Buckland and Roberts with interest at 6 percent per annum paid quarterly. William Massey entered Parliament as the member for Waitemata in 1894, but was elected to Franklin in 1896, so in later years his family called the homestead ‘Franklynne’. Massey was Prime Minister of New Zealand from 1912 until his death in 1925. During this time, he lived in Wellington much of the time, but his family and guests continued to live in the homestead. 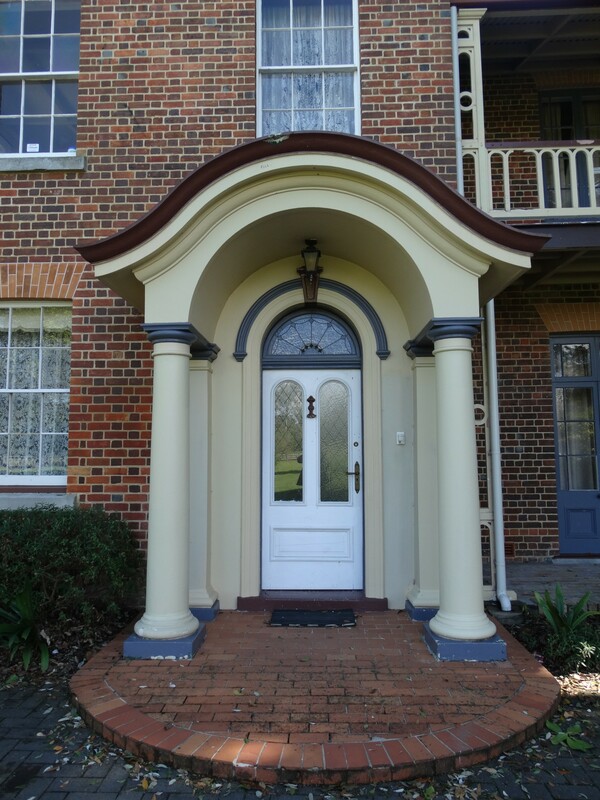 Early during the Massey family’s residency in the house, part of the verandah was removed and a curved portico with four ‘classical’ columns was added to provide shelter over the front entrance. Over the years the family made other minor changes; having the western upstairs balcony weather-boarded and the floor of the lower balcony concreted. Inside, imitation graining was applied to kauri panelling and mouldings throughout the house and the natural oak wardrobes were painted. Massey’s son Frank also added the garages beside the house and the gardener’s shed behind it. According to local legend Franklynne had a narrow escape during the 1913 General Strike when Auckland watersiders, aggrieved at Massey’s role in combating the strike, marched on the homestead threatening to burn it down. A quick-thinking visitor, Mr Feist, who was staying at the house with his family, managed to convince the men that the brick house would be too difficult to burn and that setting fire to the barn sheltering Massey’s steam traction engine would only ensure him a generous insurance payout. After William Massey’s death the homestead and land passed to his widow, Dame Christina Allen Massey. On 21 April 1926 Dame Christina sold the Auckland Education Board a parcel of land behind the house where the Mangere East Primary School was built. On 10 March 1927 she surrendered more land for the dedication of Ferguson and William streets, and between 17 May 1927 and 6 December 1928 she sold a further 15 allotments of land to various couples who purchased residential sections along those streets. Finally on 7 December 1928 Dame Christina transferred the homestead and remaining land to her son, Frank George Massey, who moved into the homestead with his wife and children. Dame Christina herself continued to live at the homestead until her death in 1932. Frank and his wife Dora liked gardening, and the development of the attractive gardens at the homestead dates from the 1930s. The mature pohutukawa and puriri trees to the northeast of the homestead had already grown during William Massey’s lifetime, but the other large native trees on its front lawn were planted by Dora and Frank during the 1930s. Dora planted flower gardens in front of the homestead. She and Frank laid out the homestead’s main drive, running from the wrought iron gates on Massey Road, and planted the gardens along both its borders. Dora had a low brick wall built backing the gardens along the drive and this enhances their attractiveness when viewed from the lawn. Dora and Frank also created a lawn tennis court in front of the house. After Dora Massey died in 1954 a group of her gardening friends decided to form the Franklynne Gardening Club in memory of her enthusiasm and the beautiful gardens she had created at the homestead. Frank stayed on in the homestead with his daughter Anne, a lawyer. During the 1950s Mangere East was still a village and the homestead retained a partly rural outlook. Change was coming, however, and in the 1960s large-scale subdivision began in the area. On 9 May 1967 Manukau City Council took a triangular, sail-shaped piece of land measuring 1 acre and 9.1 perches (about 0.42 of a hectare) extending from the western corner of the Yates Road boundary to the Massey Road boundary of the property. This was gazetted for street widening, but it seems no agreement could be reached on a satisfactory plan and the proposed scheme fell into abeyance, with the council retaining ownership of this land. 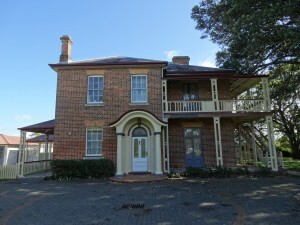 The next development came in 1973 when Manukau City Council proposed classifying the Massey Homestead as a place of historic interest in its district scheme. This narrowed Frank’s options if he ever did wish to sell the property. He decided to specify in his will that Manukau City Council would have the first option to buy the homestead and its gardens. 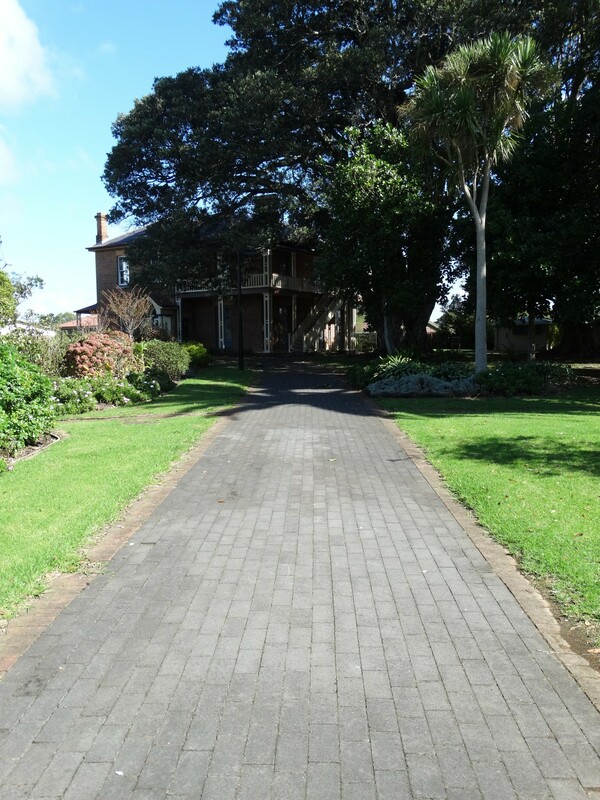 After Frank died in 1975, his daughter Anne and son Allan negotiated with the council, who agreed to buy the homestead and gardens for the benefit of the people of Manukau. In late 1976 the council offered to buy the homestead and surrounding 3 acres, 2 roods and 16.7 perches (about 1.45 hectares) for $100,000. This proposal was subject to the Massey family agreeing to a district scheme change whereby the council could subdivide and sell sections on the Yates Road boundary of the property. The Masseys accepted the council’s offer and on 20 October 1977 Manukau City Council paid a deposit of $10,000 for the property. The final instalment was paid on 29 June 1978. The council’s property manager had previously agreed that Anne Massey could remain as the homestead’s tenant until her new home unit in nearby William Street was ready, and on 30 September 1978 she moved out of the homestead. Manukau City Council now amalgamated the newly acquired land with that previously taken for street widening, so it now owned a total of 1.82 hectares around the homestead. The entire block was now resurveyed and subdivided. A large section was subdivided off behind the homestead, where Lambie Court pensioner village was built. A further four residential sections were subdivided on the corner of Yates Road. Another 618-square metre section on Yates Road was set aside as the homestead’s rear entrance and car park. After these changes were made, the homestead itself was left with a park-like garden measuring 9208 square metres on a total area of 9826 square metres (or 0.9826 of a hectare). Manukau City Council intended to use the homestead as a community and cultural centre. Council staff thought the garages, which are connected to the main house by an existing covered walkway, could be renovated as studios for community groups and resident artists. Council gardeners maintained the attractive gardens in front of the house. The gardeners also planted some small trees, shrubs and ground covers. The tennis court in front of the homestead was asphalted and developed for community use. On 20 September 1980, on the first day of the inaugural Festival of Mangere, Council formally opened the Mangere Community and Cultural Centre, consisting of the Massey Homestead itself and the Metro Theatre across the road. On the day, painting, pottery, photographic and historical displays were exhibited inside the homestead while outside players dressed in 1930s-style costumes played games of ‘period tennis’ on the tennis court. ‘Blam Blam Blam’ Street Theatre actors also performed under the trees in the grounds of the homestead. During the 1980s and early 1990s many community groups used the Massey Homestead and it housed some significant cultural, artistic, photographic and historical exhibitions. 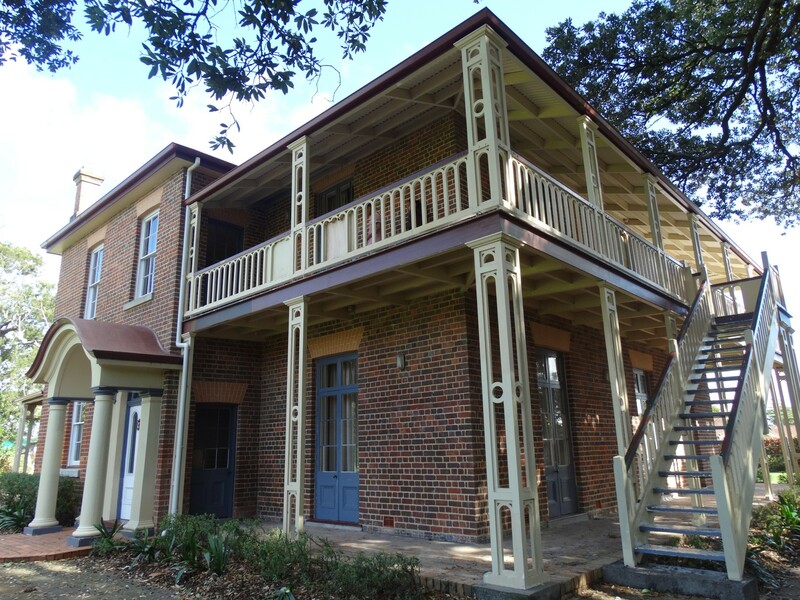 However by the 1990s council staff were aware the homestead was “structurally past its best.” The homestead’s internal framing and upper-floor joists needed strengthening if more than 10 people were to meet upstairs at any one time. So in 1994 restrictions were placed on the use of the upper rooms. While money was available to reinforce the structure, staff realised the heritage homestead could still be damaged if it was continuously used as a venue for active performances. At the same time a management review for Manukau City Council’s Arts Services had shown Mangere’s arts groups wanted to have a service that would resource them out in the community, rather than to have to travel to a centre for their artistic recreation. 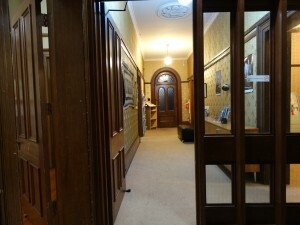 Therefore in 1997 the council’s arts service moved out of the Massey Homestead to a new Mangere Town Centre gallery, from which they could operate an outreach operation. 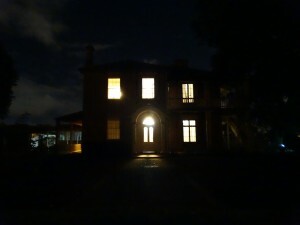 The homestead was closed for a few years, during which time the building was reinforced and Manukau City Council unsuccessfully sought commercial tenants. By 2005 the council conceded finding appropriate tenants was virtually impossible and let several small community organisations back into the homestead. However, at the time of writing in 2010, the homestead has once again been closed for maintenance. The tennis court, thought to obstruct a clear view of the homestead from the road, has recently been removed. Nonetheless the Massey Homestead’s grounds are still used by the community. For instance, during ‘Summer Sounds in the Park’ events in March 2010, when Oceania Storm, Banda Latina, Allegro and Cydel and the Groovehouse performed. It is thought that William Massey still resides within the walls and makes himself known to staff and people visiting, from time to time. The activity reports are rare but there have been claims of moving shadows, items moving around the rooms and voices through the years. Before entering the building as the team were waiting outside for the security guard to arrive Amy, Barbara and Kimberley were all unnerved to see what appeared to be a white dog, just sitting there in the darkness, silent, seemingly ‘staring them down’. Being cautious not to aggravate the situation the 3 backed away. At this time the security guard pulled up to let us in. On turning back, the dog had disappeared. No one saw it leave, causing the girls to doubt what they had actually seen and whether it was even a dog they had been seeing. 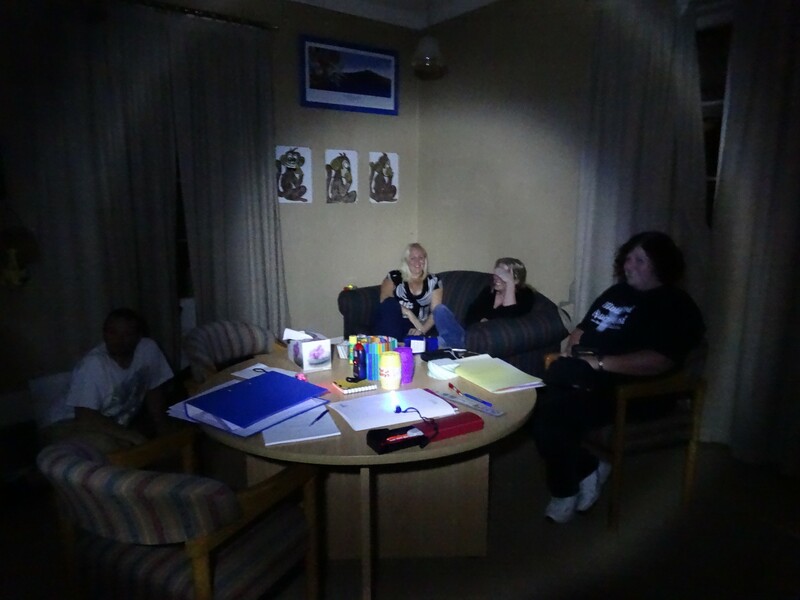 Team Members on this investigation: Mark, Ian, Barbara, Amy and Kimberley. Weather conditions: Cloudy and humid. No wind. Luna cycle: The Moon was in its first quarter. 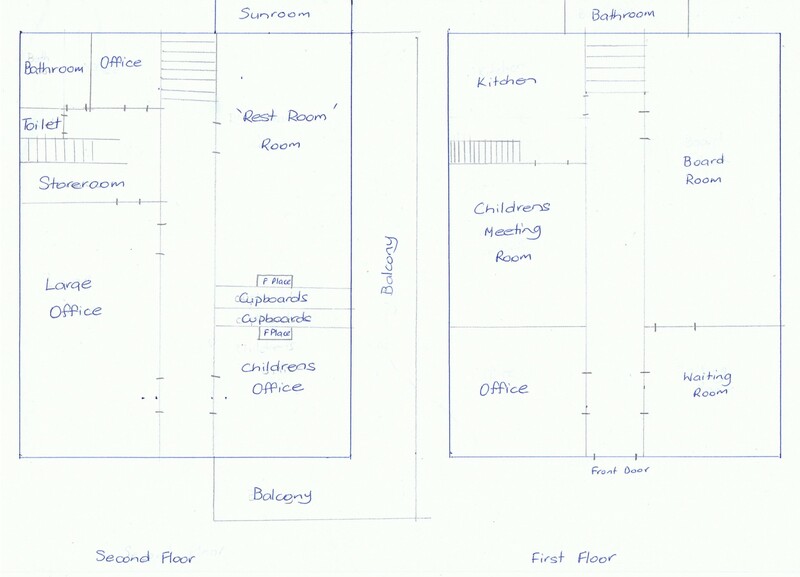 Building layout plan by Barbara. – The Building is an imposing two story historic building consisting of red brick and timber. – The house was designed as English colonial style with regency details. 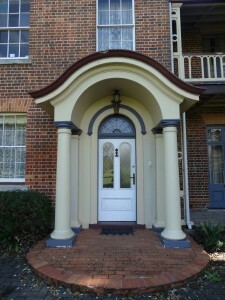 – The red brick was imported from Melbourne. 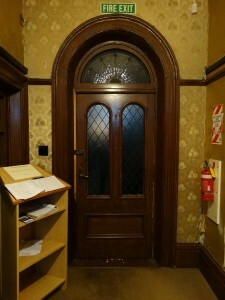 – The building is about 164 years old. 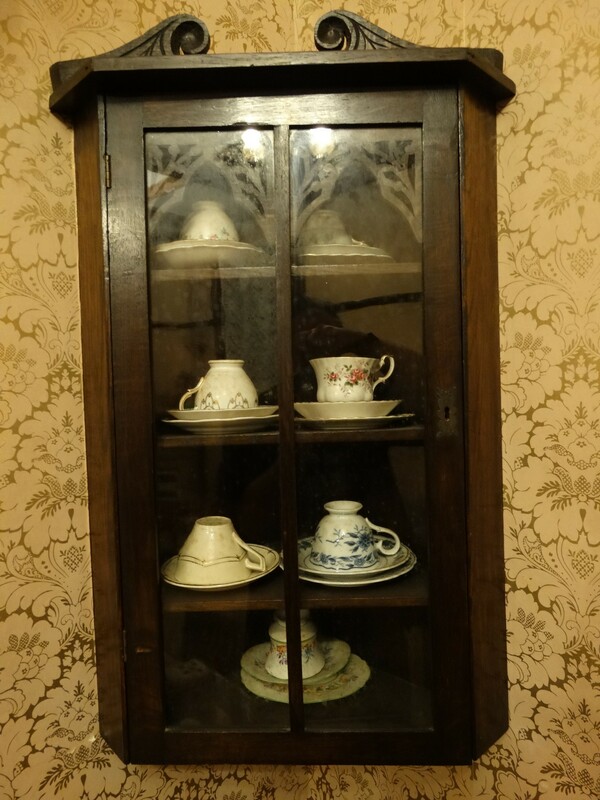 – There appeared to be a dining room, Lounge, Parlour room, kitchen, bathroom and one other room down stairs, there also was a cupboard under the stairs that had an entry hatch that lead to under the floor boards. 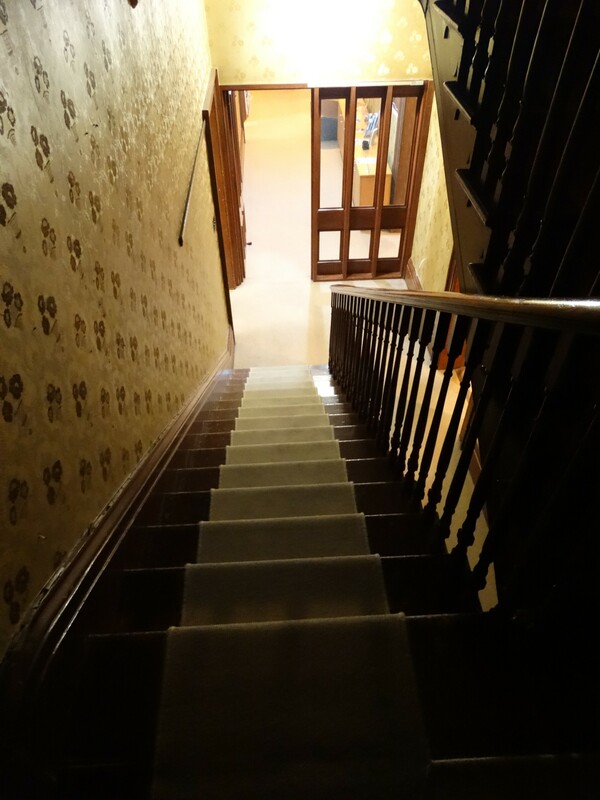 – There were two sets of stair cases leading upstairs. There appeared to be an attic upstairs but we were unable to get up there as we had no ladder. 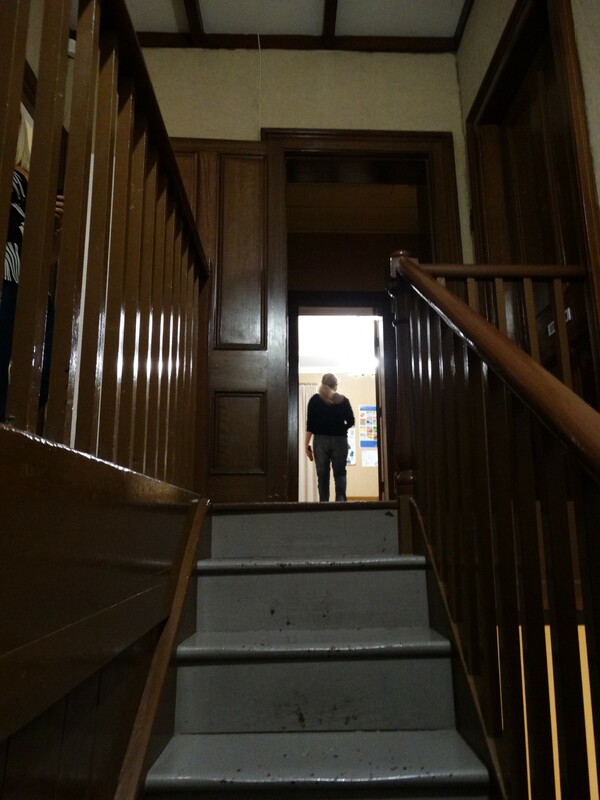 Kimberley – Upon entering the building we were hit with a smell that reminded you of an old building. I got a feeling of calm and warmth, but on entering the upstairs master bedroom and the office with the table in the middle and lots of children’s toys there was heaviness in those rooms. I still felt like it was a calm environment. There was no change of emotion or mood while entering the building. We were still able to have a laugh and be jovial. But it did feel as though we were being watched at times. 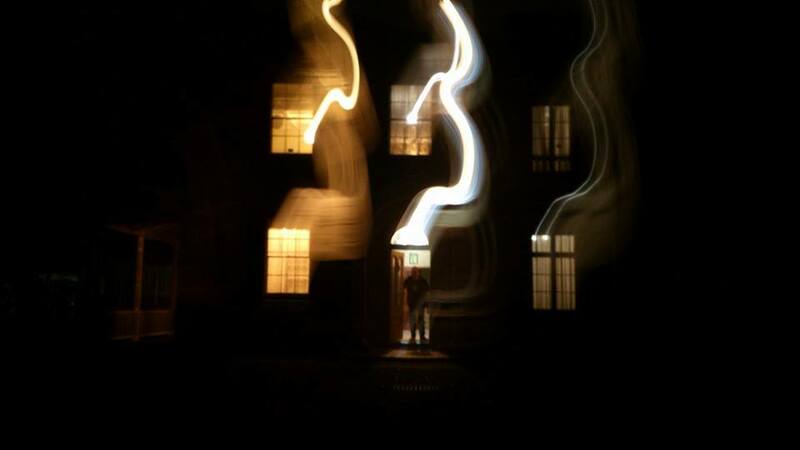 We started with a walk through with all the lights on, and we were ‘taking in’ the building and all of its rooms. Getting used to the sounds that the building made and taking photos and base line readings in all the different rooms of the house. The rooms that stood out to me was the upstairs master bedroom, the room with the small round table and lots of children’s toys and the larger office room upstairs with the two desks and the round table in the middle. Barbara – A Lovely old building that had been really well renovated to the point that it didn’t appear to be old. 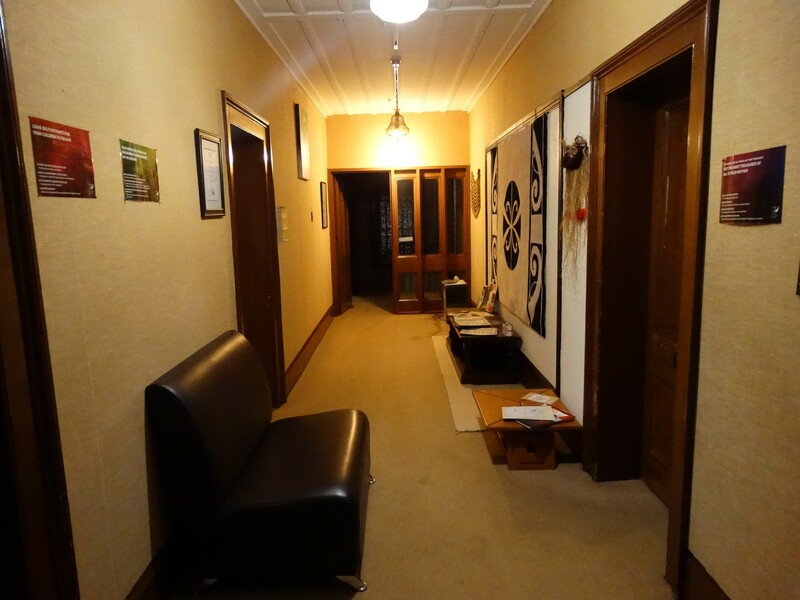 Once we moved out of the front reception room and board room however the condition of the house became more original (although had still been very well maintained and slight renovations had been done, including modern bathrooms, toilet facilities and kitchen). Some of the rooms seemingly had not been used for a while as cobwebs hung down from the ceilings and sometimes brushed against us as we walked around. In these unused rooms there was also a musty odour. The house also looks a lot bigger from the outside so I was surprised that there was not more to it the first time we walked through. In a couple of rooms I got a feeling of pressure in my ears but I did not get any emotional feelings in the house (besides just loving it because it’s a historical building). We also noticed that some of the rooms smelt old and musty or of ‘cat urine’. 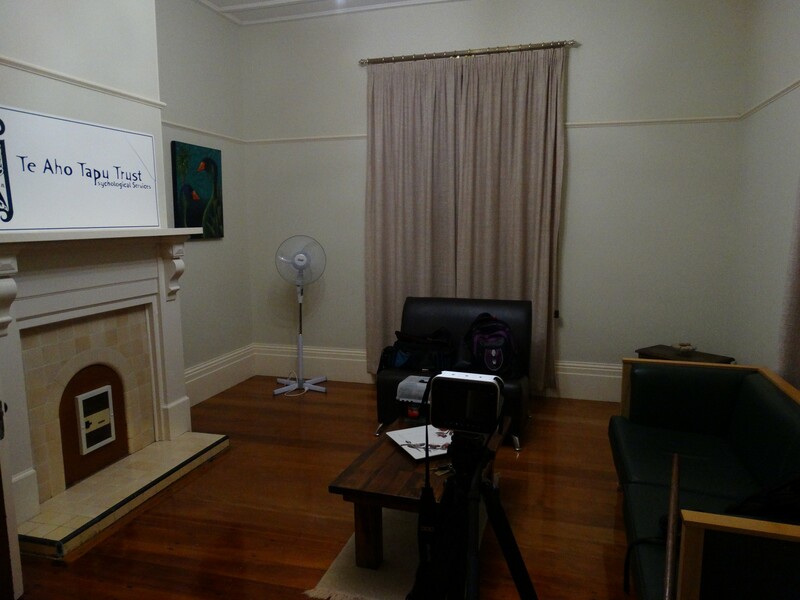 Ian – It was like an old hostel, a bit run down and lots of posters and info about abuse in families. I felt like this was the last resort for many families, a place where children are taken after a major event in their family life or experiencing violence in their family life. A very sad feeling, having children of my own, it makes it sad to think children go through this. Some rooms felt very stuffy, like as if the windows were never opened. Felt like workers here worked in stuffy rooms but wasn’t to clear what the rooms were used for. They felt very heavy, not a creepy feeling just no air. All the rooms felt similar, hard to breathe in any of them. Too many computers or electronic equipment around, possibly. The layout of the house was a bit strange. The stairs were steep and narrow. It looked like some of the rooms were used to council adults too as there were toys available in most places and the tables were full size not small ones that you could sit with a child at. Amy – “old. but well-used”, was my first impression. Certainly dated but you could tell the people now were using the building to the best advantage for their particular needs. I actually thought it would be a nice place to hold a wedding reception or other such special event! I like the fact it is a well-used place which I think made me feel comfortable and relaxed when walking around it. No eerie sensations like I had at Kingseat. 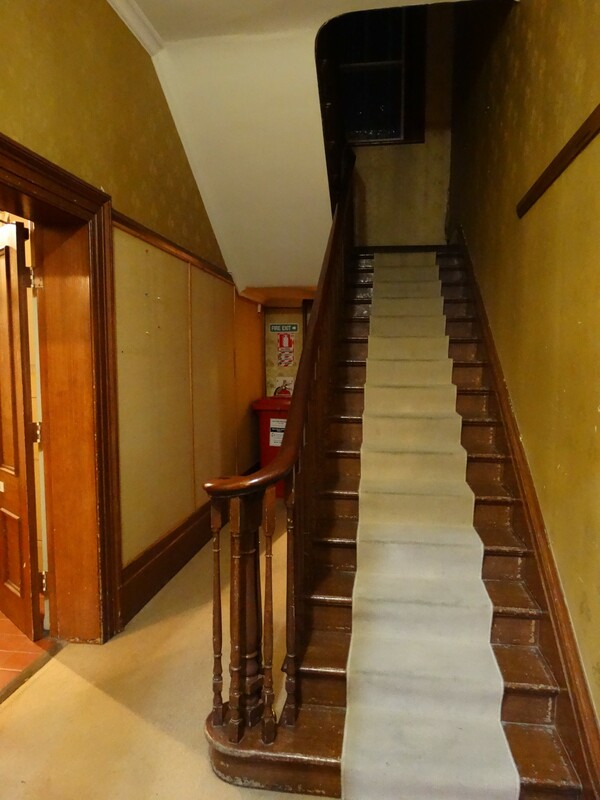 I loved all the little stairwells and the layout of the rooms. It was easy to imagine how the rooms would have been used when it was still the homestead of the Massey family. Mark – It’s a ‘busy’ building that obviously has many people working and communing daily within its many rooms. There’s a real ‘life’ in there though. Lots of caring, teaching and community spirit evident all around. To me it felt like a happy and productive, yet peaceful place to be. A place of support, learning and compassion. This is a re-creation photo of the ‘person in the window’ incident. 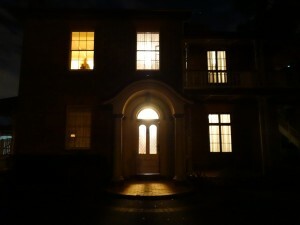 Mark – I went outside to take photos of the front of the building. The lights were on in the home. As I got into position, I saw a shadow who I thought was either Barbara or Kimberley standing in a top floor, left hand window. I couldn’t see any features, just a dark person form looking out the window. I didn’t want them in my shot so waited until they moved from the window. The ‘person’ then moved out of sight and the lights turned off immediately as this happened. I wanted the front window lights on for my shot, so quickly leapt a few meters closer to the house, yelled up to whoever had left the room to please turn the lights back on in that room. 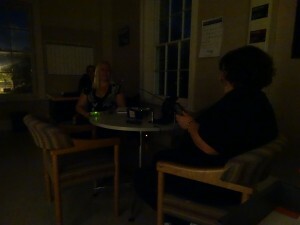 This was a matter of about 4 seconds from when the lights went off. No one answered me. I yelled out again. Still no answer. After a couple of minutes, Kimberley who had heard me yelling out, came to see what I wanted. She claimed it wasn’t her that had been in that room at the time and the others in the team had been in a whole different part of the building at the time. I am now kicking myself, that I didn’t take any photos whilst the shadow person was standing there! I only have the after- photo I took about 4 seconds after the ‘person’ left the window. Kimberley – The only thing I saw was in the larger upstairs office (the one with two desks and a small round table). Amy was sitting at the desk on the left hand side in the corner. I was sitting at the round table facing the wall opposite the table and Barbara was sitting across from me on the round table. I saw a shadow against the wall, of an arm and a hand with five fingers. At first I didn’t react to it as I thought it was one of our arms and hands. However when I looked over to Amy she had her hands in her pockets and when I asked whether she had moved her arms she said ‘no they had been in her pockets the entire time’. Then I looked at Barbara and she was holding the spirit box with both hands. So I tried to recreate the shadow and was only able to do it by standing next to Barbara and placing my arm and hand just over her head. There were no trees outside the window or anything else that may have cast a shadow similar to an arm and hand. Also in the same room earlier in the evening I felt a rather large gust of wind it was so strong in fact that it blew some of my hair back. At first I thought it was Mark walking passed me but as we tried to recreate it he was not able to do it. However on closer inspection there did appear to be a breeze coming from underneath the door, which might explain it. Barbara – The “Rest Home” room was very interesting. We referred to the room by that name because it was a large room with comfy chairs which had been placed in front of the windows and it smelt old and musty. I had a sense of something being there and I think that most of our group also felt that way. I thought that the Childrens Office beside it also felt as if there was a presence. The Large Office across the hallway from these rooms didn’t have the same eerie feeling but that was where Kimberley saw a shadow hand on the wall and we got reasonable results from the spirit box there. While Kimberley, Amy and I were in the large upstairs office trying a communication session with the spirit box Kimberley saw a large shadow of a hand reach out on the wall. When we tried to recreate what she had seen we discovered that the hand had actually been over my head as I was holding the spirit box. 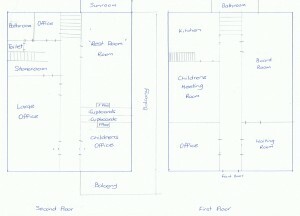 Amy – The Master Bedroom stood out to me the most. This is the one where my imagination decided to run away from me with the idea of something coming out of the double wardrobes at the end of the room! But that was based on nothing more than too many horror novels and movies, and not anything I heard or saw in the homestead. 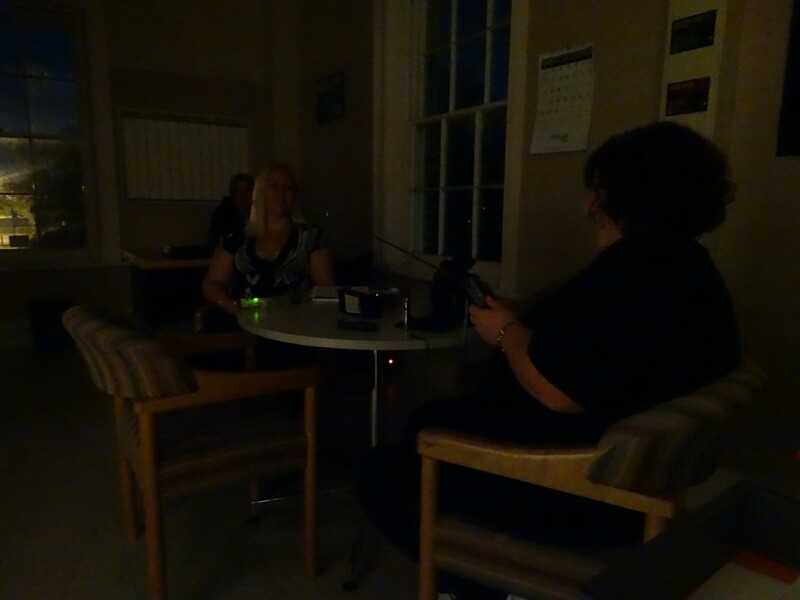 As usual, a full room by room, periodic EMF and temperature sweep was done at intervals throughout the night. EMF (Electro Magnetic Field) levels throughout the location were pretty flat in all rooms. Only exceptions being near the power meter box I the kitchen which was giving off an unusually high, ‘off the scale’ field reading. Kimberley – The only cold spot that I felt was at the end of the investigation at almost midnight, where I had become very cold all of a sudden, my skin had become icy. However we did not record the temperature then. But throughout the night the temperature remained the same. Mark – I did experience a few brief, icey cold ‘whips’ of breeze around my neck. Once whilst ascending a thin wooden stairwell and another on entering one of the closed rooms upstairs. At the time i dismissed it as random breezes, but there werent any open doors or windows i could see. Possible odd air movement perhaps? Undecided. A communication session was attempted in a childrens upstairs Toy / Play room. As a trigger object, we used one of the toys and asked if anyone would like to play with it. Also set up was a blue glowstick . This was to be knocked over or moved if ‘anyone’ wanted or was able to do so, to give us a sign of their presence. Barbara: Is there anybody in here with us? (We felt a vibration probably from passing cars but it was not captured on the recorder.) Can you make a noise? Let us know you are here? Can you say something please? NO response. Barbara: Please come and talk to us, we don’t want you to be scared we just want to get to know you. NO response. Mark: Are you here William? Can you yell out if you are here? NO response. Barbara: We have heard you died here William, is that right? (Tapping is then heard, and it was captured on the recorder). Mark: Does anyone want to come play with us? Someone give us a sign please? A strange whisper was captured at this moment sounding like, “thou shalt not…… “ , It is vague and hard to make out what is said accurately though. Barbara: (Again) Is there someone in the room with us? No response. 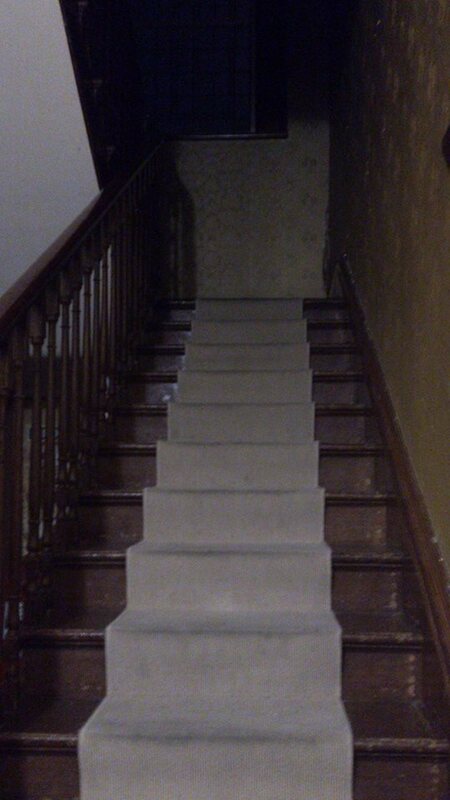 Another possible whisper is captured just as we were getting ready to go downstairs. Barbara – We did several communication sessions in areas around the house. We asked the usual questions but at the time didn’t seem to get any response. Upon review it does sound like we may have been getting faint responses to the session we did in the childrens room beside the kitchen but at the time most of it wasn’t heard. We also did a couple of sessions with the spirit box and got the names ‘George’ and ‘Seth’ multiple times but nothing more. A “Ghost Box” originally named the “Frank’s Box” was created in 2002 by EVP enthusiast Frank Sumption for supposed real-time communication with the dead, Sumption claims he received his design instructions from the spirit world. The device is described as a combination white noise generator and AM radio receiver modified to sweep back and forth through the AM band selecting split-second snippets of sound. Critics of the device say its effect is subjective and incapable of being replicated, and since it relies on radio noise, any meaningful response a user gets is purely coincidental, or simply the result of pareidolia. However we have been trialing a box within our EVP communication sessions in the interest of open minded-ness and practical experimentation. 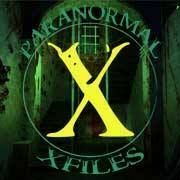 Disclaimer – The accuracy of the Spirit Box can be questionable, as sometimes we are able to pick up snippets of actual radio stations. We are not implying that we have captured actual spirit voices, but as the sounds occurred, seemingly on cue and directly after questions, we thought we would include them into the report out of general interest. Kimberley – Personally I feel the investigation went really well. We all worked well together as a team and we communicated any feelings we had at the time. However we started late as the security guard didn’t arrive to let us in at the specified time and I think that didn’t hold us in good stead to start the investigation as we usually would. However I think we did really well as a team. 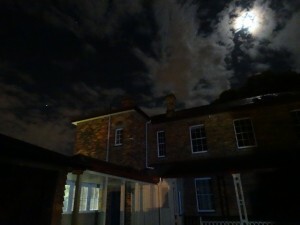 Scientifically, Massey homestead is not haunted, as I was unable to gather enough scientific evidence to prove otherwise. 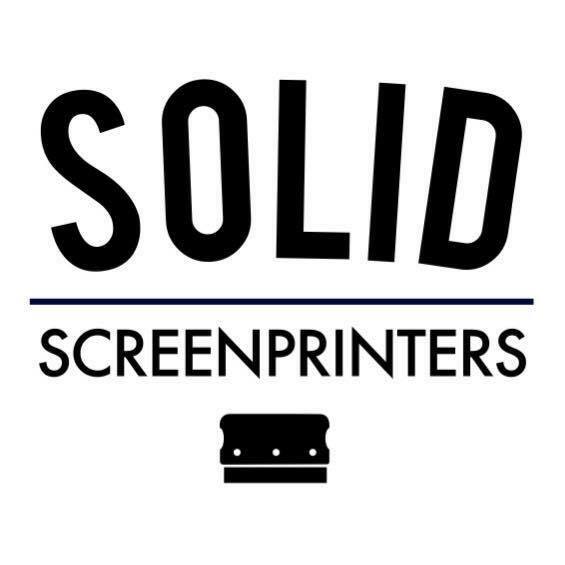 There were a few personal accounts of activity we were unable to document with our equipment. However if I was to go by feeling alone, I would say that there may possibly be a residual haunting. I felt energy there but it was a warm and calming one. We had a fantastic investigation with a great team, who supported each other and we were able to work successfully as a team. We got the best results we could at the time. Barbara – It was a shame about the investigation starting late but once underway it was great. The team worked really well together. It was nice having a group of newer members with us. My spirit box did keep getting the name ‘Seth’. I checked the name and it is in fact a very old biblical name and not short for anything. Also upon reviewing my audio I’m surprised that we did get the name ‘George’ three times and in three different rooms. Also, ‘Seth’ responds with the name “George” when we ask him if anyone is with him. I did try to research to see if either of those names had a connection to the family (possibly William’s children) but I could not find any reference to the names of his children (other than the two who later became politicians). While we were at the house I did not see anything that would convince me that the house is haunted. I did however see enough to make me suspect that it may be. 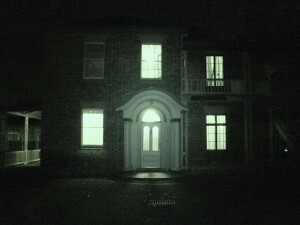 Mark saw a figure in the front window which turned out to be none of the team, the same figure also appears to have turned out the light. Kimberley saw the shadow of a hand on the wall in the same room and I do appear to have captured very faint responses during EVP sessions in the house. Unfortunately we were unable to actually capture any of this as photographic evidence and the audio was barely audible so also cannot be considered as positive evidence. Ian – I did not experience anything strange here. I felt detached from the place, couldn’t relate to anything to goes on here, just felt a bit depressed when I thought about how families that come here could be in a very bad situation or could be in a place where there is abuse, violence or possibly drink or drug abuse. I would say lots of innocent children that have been put through a lot come here before its decided what happens to them next. 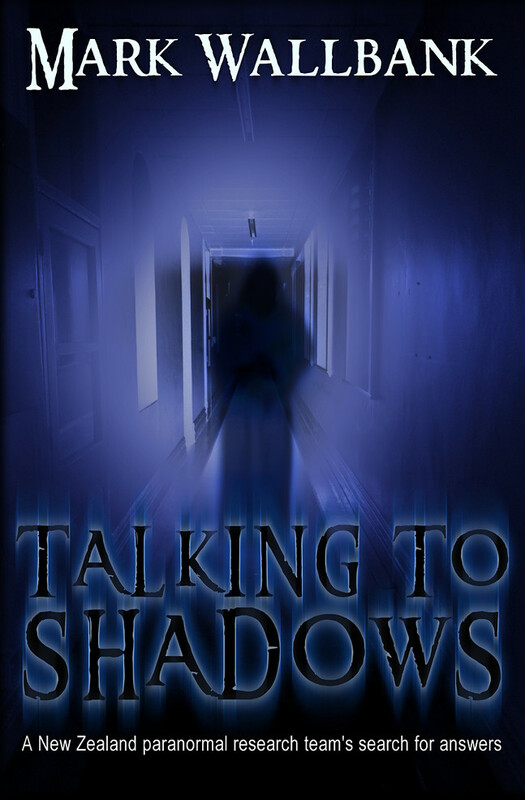 Amy – I didn’t really feel or see anything, although I was in rooms with Kimberley on a couple of occasions when she saw things (like a hand/shadow moving on the wall) but I remained blissfully unaware of anything! I got slightly jittery about different noises by the end of the night, but I think I was tired and they were probably normal sounds associated with an old house settling. I enjoyed it, and think it went really well – we seemed to have a lot of time for completing things without feeling rushed, re time etc. 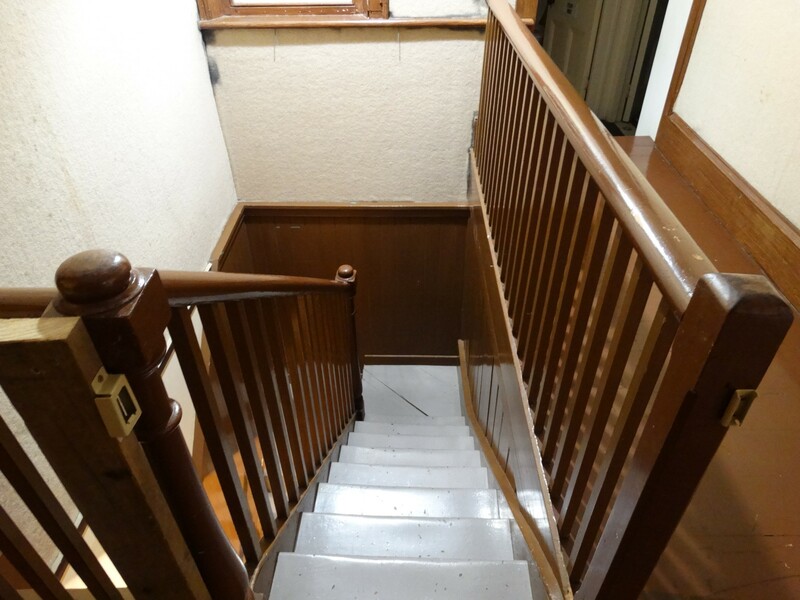 I Feel the second floor was worthy of more investigating, whilst the 1st floor didn’t seem to have any potential – but that is gut instinct and not based on anything else I must stress. We did a few EVP sessions as a whole group and also one in the old master bedroom with just myself and Kimberley. I didn’t ask any questions myself but others did and there were occasional knocks etc. These could have been in response to the questions, but I didn’t feel there was enough evidence to prove this as they could have also been just normal ‘old house’ noises. Personally I didn’t walk away from the Massey Homestead feeling like I had seen/felt/heard anything that provided evidence that it was haunted. Might be wrong of course – and I certainly didn’t hear or see anything that others in the group heard and saw, apart from the occasion knock which I still put down to the house settling. It was a great few hours spent in the homestead, and lovely to see an old building being used so productively by the community. This feeling of warmth and current occupation certainly added to my own relaxed feeling when we were doing the investigation. Enjoyed spending a few hours getting to know other’s in the group a bit better and found it interesting that some members of the group saw/heard a lot of activity whilst I honestly didn’t see or hear anything out of the ordinary. Might be a case of me not being quite so in-tune with paranormal activity though!! Mark – I really enjoyed my time in this building. 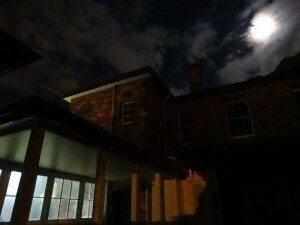 It was a quiet, peaceful and cool , clear night which helped in making perfect invesigation conditions. The smallish team this time worked very well together on documenting the surroundings and experimenting with various techniques. I personally didnt see, hear or notice anything within my time there which would lead me to believe that the Massey Homestead is haunted, though it would certainly be nice to think that William Massey still resided there and was looking over his old abode, seeing how it has developed through the years and the positive and community caring way it is being utilised to this day. I think he’d be very pleased indeed. The team took hundreds of photos of the full interior and exterior of the homestead. Plus about 6 hours of audio and around 3 hours video using standard and IR nightshot cameras. Communication attempts were conducted and audio recorded. A few unusual moments occurred during our time there that we could not explain, though we unfortunately were unable to properly document these occurrences as definite evidence. A big thank you to the Massey Homestead for the pleasure and honour of allowing us unaided afterhours access to this beautiful and iconic prestigious South Auckland property. Acknowledgement and a big thank you to Christopher Paxton, who’s fascinating written history we have reproduced here. You will need to contact the building owners, the Auckland City Council or the Mangere Arts Centre for further information on venue hire. 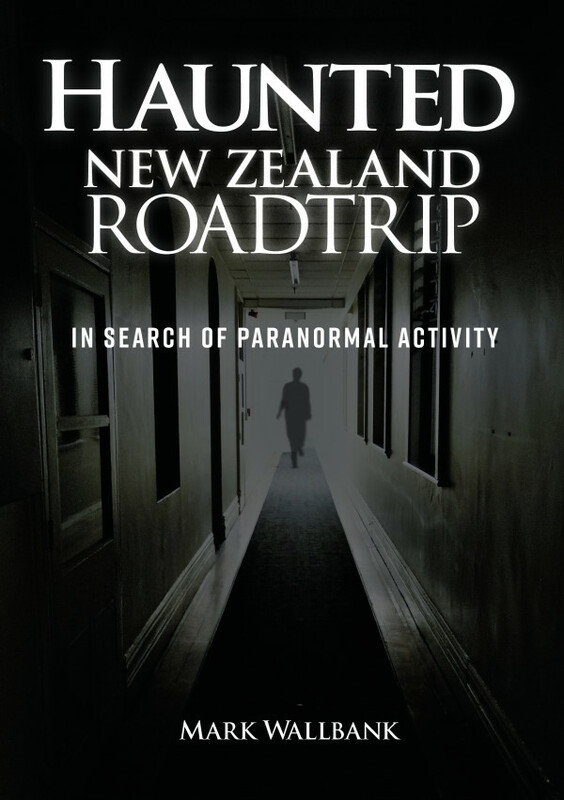 As we were only visitors at the Massey Homestead in April 2014, we cannot organise this sorry.